Prize DrawsWin 3 items of Footwear and Accessories from Hotter! 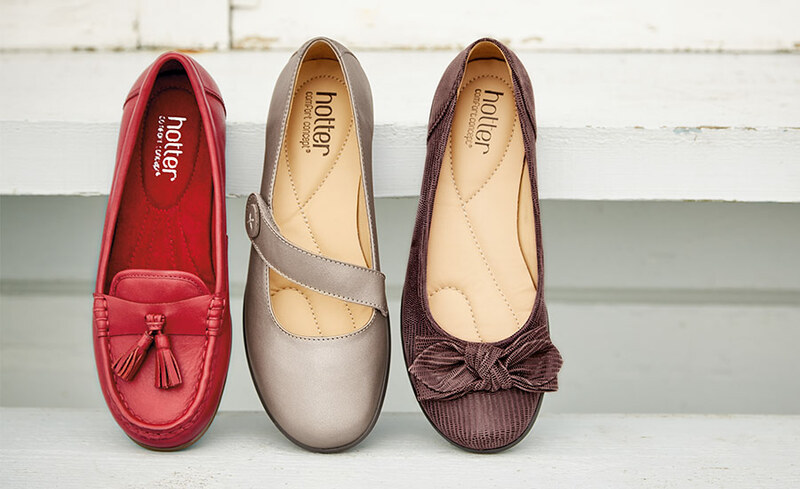 Win 3 items of Footwear and Accessories from Hotter! 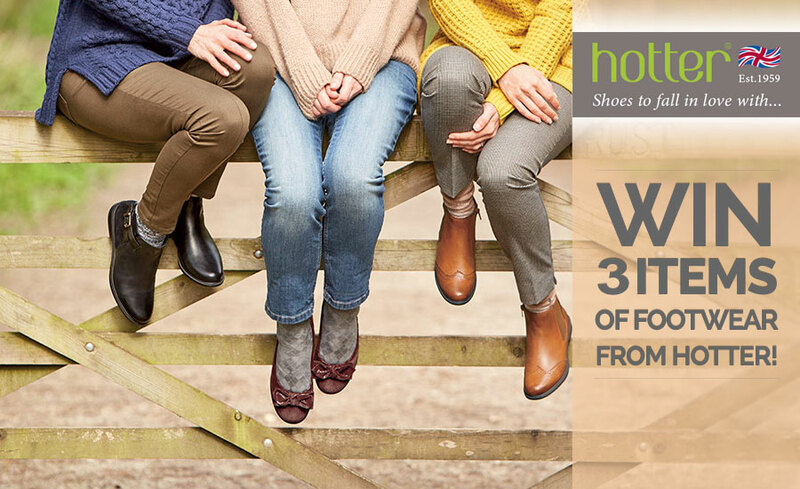 Enter this Prize Draw to be in with a chance of winning 3 items of footwear including women’s and men’s shoes, boots or even accessories such as a handbag from our friends at Hotter! Choose from their current sumptuous new collection. This season their designers have travelled the globe in search of inspiration, and sourced the finest materials to produce styles that offer beautiful textiles in rich seasonal colours and on-trend styling. Hotter was set up in 1959, and they’ve been designing and making footwear now for 50 years! They diversified from their roots – slipper production – in the early 1990s, when they had a ‘eureka moment’ – identifying a niche in the market for stylish shoes with comfort built in. Since then product innovation, world class production facilities and continual reinvestment in their business has seen their shoe collections expand beyond all recognition and their circle of Hotter friends grow by hundreds of thousands each year. If there’s one thing many people notice when they visit their factory in Lancashire it’s the passion and dedication of all the Hotter team: passionate about comfort, passionate about style, passionate about shoes. Every member of the team is dedicated to delivering ‘wows’ whether from the friendly service when you speak with their call centre, the careful packaging of all shoes when they land on your doorstep or when you enjoy your first ‘Hotter moment’ – that feeling of sinking your feet into soft, cushioned comfort, when you realise everything we say is oh so true! I would love to win as I find them the most comfortable shoes on the market, worth the money but still expensive when on a budget. Stylish and practical; a great achievement! Love Hotter shoes,make me feel like walking on air. I would love to win so I could get a pair of Hotter shoes for my husband - let him see why I'm so keen on them! I would love to try the comfort and warmth of Hotter boots!!! I only wear Hotter shoes, Mary Janes are most comfortable. There are some great styles and wonderful colours. I love Hotter shoes I have a couple of pairs of ladies trainers, as well as some flat shoes. They are so comfortable. I have red and black Hotter ankle boots,I love them they are so comfortable. I would definitely love another pair. Love Hotter shoes they are so comfortable and last for years. The only shoes I wear now. I've worn Hotter for a few years now. I have wide feet and find shoe buying very stressful! First bought Hotter shoes for my Mum and am now a fan of them as she said they were so comfortable. I buy Hotter shoes as they always have some that are just right for me, and I could certainly do with some new ones. Since buying my first pair of loafers with leopard print trim I have been completely won over by Hotter, the shoes and a pair of boots I bought are the most comfortable I have ever had. Probably because they do the magical half size which means the end of guessing going smaller to stretch or larger to add insoles.I am also amazed at the modern styles available and have my eyes set on several pairs from the current range. I honestly used to think Hotter were for old people but how wrong I was, and having taken my daughter with me, she has also been totally won over. Between us we are spreading the message. This could "kit" me out for winter, very stylish! According to my children & grandchildren, I'm usually far from stylish!! Think my wife would love these. It would be very indulgent to have 3 new pairs of shoes all at once. I need good quality, comfortable shoes and Hotter shoes are perfect for me. Wear my Hotter shoes so much that the laces are poorly! Help. Always enjoy the new styles and fit at Hotter. New Hotter shoes. What's not to like? I would love this prize because I have heard from friends that Hotter shoes are lovely and comfortable. here's hoping, my sister told me Hotter are great shoes. Smart, comfortable shoes. Never disappointed with them. I have several pairs of Hotter shoes. They are so comfortable, but I wish they did more in a wide fitting. A lovely prize which I'd be very happy to win! I Always wear hotter shoes, they are so comfortable . I was on an eternal quest for comfort then I discovered Hotter shoes.!!!!! Hotter shoes are the hottest!!!! What a great prize, if only!! It would be a christmas present for myself if I won! Wardrobe is full of Hotter shoes... but I still need some more! Hotter shoes are the most comfortable ever. I love them. So comfortable, can't have enough hotter shoes! Fingers crossed! Can never have enough shoes especially when they are "Hotter"
I would love to have a pair of Hotter shoes as I have been told they would make life more comfortable for me with my large and wide feet. What a wonderful prize this would be!! Oh yes ....love Hotter shoes! Most comfortable shoes ever, and trendy too. Wide or big feet....both in my case!....you can walk miles in comfort in Hotters. Comfort and style combined are hard to find. Thank you Hotter! I would love to win always looking for shoes for my large feet that look fashionable as welll as comfortable, Hotter hit the mark. I can never have enough comfortable shoes - and Hotter shoes are always guaranteed to be comfortable! A girl can never have too many pairs of shoes..... a wonderful prize fingers crossed! I need to wear comfortable shoes as I have Osteoarthritis in my knees and spine. How wonderful not to feel the hard ground jar my knees as I know hotter have quality soles. What a wonderful company Hotter is. I wanted a furry headband they were selling as a Christmas present for a friend, they were out of stock online and at the local Hotter shop, but the young lady behind the counter sent an email around to other shops and they posted the item from the Canterbury shop to me, such great service. I would love some of their shoes, comfort personified! Having foot problems for more years than I care to recall, Hotters are one of 2 manufacturers whose shoes are a joy to walk in, the better of the 2 are Hotters because they are more in my price range. All my shoes are Hotter shoes but another 3 pairs would be good. I particularly love my purple ankle boots! I have bought & worn Hotter shoes & boots in the past, until they got beyond repairing. Would so like another comfy pair. I already have 1 pair of Hotter shoes and would love another 3 pairs. They are so comfortable. I wear mine all the time. I'd love some Hotter shoes - I've heard really great things about them! What a lovely prize,to win fabulous shoes! Best shoes ever - discovered them 5 years ago and would not buy any others!! Shoes that make me feel as if I am walking on air ! Always a comfortable shoe and with half sizes as well, a really good fit. Comfort, reliability, style and value for money. Quality, reliability and comfort at its best. Thank you Hotter. Love hotters, I have so many problems with my feet and hotters are the only footwear that feel comfortable! Love to try hotter shoes . my wife simply loves your shoes, and the great service she gets in your stores. Would really like to try some of Hotters footwear as I have heard some race reviews. What a great competition Silversurfers, I love Hotter Shoes. You simply cannot beat Hotters for comfort. You just can't beat Hotters for comfort❤️. Hottest shoes on the market. Last year I bought some Goretex boots I'm still wearing them. A new pair would be a lovely Xmas present. I have been wearing Hotters shoes and boots since the 1970's. I love them and don't wear any others. Need comfortable shoes now and hotter shoes are amazing. Love Hotter shoes, so comfortable so I have lots of pairs but would love one of their handbags too. I have several pairs of Hotter shoes, plus my husband absolutely loves his Hotter shoes. Which I chose via the catalogue, as a surprise for several. Birthdays. The way to GO!!! Hotter she's and handbags! This is certainly the time of year to be "Walking in the air". Getting Hot Hot Hotter ! Never leave home without Hotter!! Some of my shoes are Hotter. Very comfortable. Shoes & Boots are always very handy. Hotter footwear is always quality. Is this my lucky entry? A girl can never have enough shoes - and hotter the better! I just love these shoes .So comfortable. Hotter shoes are just the right thing for the "gal about town ". So sensible with age so love Hotter as they are modern with cushion comfort and fit an 8 so well. I have huge feet (my dad used to say I didn't have feet, I had yards!). They would make a Hobbit look dainty but Hotter shoes actually fit, Yay!! Love Hotter shoes and boots. Fantastic prize. My Hotter shoes and ankle boots are the comfiest I've ever worn and now I just won't go anywhere else! This is a competition from heaven. After visiting the doctor today with pains in his legs and back, my husband has been told to buy some good fitting shoes, what could be better than HOTTER!!!!! Just because I am older doesn't mean I am not bothered about fashionable shoes, I most certainly am! With hotter shoes I get fashion and comfort. They are budget friendly to boot. This is why I browse Hotter and know I will be happy with what the postman brings. Wow 3 new pairs of shoes at the same time!!! Miracle. As you get older comfort comes first but not at the expense of style. Hotter gets my vote on both. What a super prize , I just love Hotter shoes. Very exciting, hope I win! Hope it's me, I need new boots! What a treat this prize would be. How lovely to be able to raid my local Hotter shop! Hotter shoes are so comfortable. Fingers crossed. Would be amazing to win your fantastic shoes. This company understands feet come in all sizes and shapes, no wonder their shoes are so comfortable and practical. A pleasant surprise for my wife always talks about the quality if Hotter shoes. Oh how wish, might be lucky this time. Im jumping in with both feet for this prize. Got to be in to win! I'm desperate for some comfortable boots. My feet are too big for Hotter, but my wife absolutely loves them as they never need breaking in. Love Hotter shoes! Wish they made more styles in slimmer fitting. The thing is am I getting hotter ? Always stylish with the added extra of comfort! Love hotter shoes, never need breaking in. All my shoes are hotter, just wish men's came in wider fittings. New, comfy winter boots would be very welcome. I never wear any other brand. So comfortable and light weight. Such hard wearing. Good old Hotter I love your shoes. Would like to try this make of shoe. I've heard they are very good. Such comfortable shoes even for problem feet ! The shoes and boots look great. The boots would be great with the very cold icy weather. fashion and wonderful comfort is just what I need. .
Not easy to combine comfort and style but Hotter ticks all my boxes! Tney are great shoes and would make so much difference to my life. Could really do with some decent boots. I badly need some new shoes as I can't wear high heels since I broke my ankle. Just love hotter styles and comfortable shoes. Depend on my feet and my feet depend on Hotter. Hotter shoes come with a comfort tag but look good too!!! Hotter are so stylish and comfortable.Wonderful. Always buy Hotter because they are really comfortable. Just what I need, lovely comfortable shoes. Gosh, just what I need! I buy hitter boots,shoes and handbags! Justvlove the fut and styles! Being over 60 does not mean you have to wear frumpy footwear! The best Christmas present I can imagine! The only shoes on the planet worth wearing Love them!! Hotter shoes are the only shoe to make it to my feet. Good quality leather and always a comfortable fit. As an ex Police officer, I was always looking to wear comfortable shoes or boots for on duty or off duty.I always had to use "Another Brand" but they used to puncture quite easy. Hotter shoes or boots do not have that problem. Even though I am now retired, I still need comfortable shoes / boots. Amazing prize, amazing shoes !!! never tried Hotter shoes, have arthritus in both feet so need really comfortable shoes and these sound ideal. I like the look of this footwear and anticipate they would be comfortable. I have recently converted to become a fan of shoes / boots with high ankle cuffs. I desperately need some comfortable shoe wear like Hotter as l have found them comfortable in the past few. Love the comfort of hotter shoes the only shoes I can walk any distance in. Would love to be able to choose different styles for all occasions . My favourite footwear......comfort & quality! Lovely warm slippers for the cold weather would be one of my choices. A pair of comfortable walking shoes would be great when out walking my dog "Cody"
After years of stilettos and tight shoes, my feet deserve the comfort and quality of Hotter foot wear! Love comfy the hotter the better ! Just back to uk after living in Canada - anxious to try something new and comfy ! Love to be kind to my feet! I'd love to win this prize.....could do with a good quality pair of comfortable boots. Good luck all. With troublesome feet like mine, wearing Hotter shoes is like wearing your slippers all day. Comfortable and very stylish. Love hotter shoes so comfy, yet still stylish. Most comfy shoes ever. Can wear them all day and your feet feel great. Stylish too. Shoes you can walk in. Would love to own a pair as they look so comfortable,I think I owe it to my feet. Heard such good things about Hotter shoes, would love to own a pair! I have had my Hotter shoes for about 18months and I always wear them if I am going to be on my feet fir a long time as they are so comfortable. Hotter Boots are the only knee highs that fit my calf muscles. Love the comfy foot and sole support. Would love to own the knee highs. I have friends who rave about Hotter footwear and it would be lovely to join them, best of luck to everybody who enters. Beautifully made, stylish and comfortable for those of us with wide feet. To win some would be wonderful. Comfort is sewn in with every stitch, this combined with the high quality of materials used, guarantees the most comfortable footwear ever. I have size 3 but EEE width ! Can usually find a shoe to fit with Hotter. I love hotter shoes. They are stylish and SO SO comfortable. I forget I have shoes on! Would love to win some. Great prize ....count me in please ! Will have great fun choosing my selection ready for winter . I love the quality, comfort and style of Hotter footwear and accessories. Never had the Hotter experience, would be a superb opportunity !!!! Bought one pair last year and this year I have to decide between Clarks or Hotter. Both have a nice feeling when I put them on. Love the comfort of these but can't afford the very often. Expensive for me, so would be good to win the prize draw, though I would be happy with one pair of shoes or boots. Love Hotter Shoes, great to wear all day, hardly know I have them on. Always a good fit. So comfortable to wear. My wife has worn Hotters for some time ... now I hope it is my turn to try them! Also I like to support local businesses and Hotters are made close to my home! The only shoes I am able to wear. So comfortable. Never had a pair but they look lovely good luck everyone x. Such comfy shoes and great value. I am told that Hotter shoes are the most comfortable shoes you can buy. My feet just love being enclosed in Hotters!! Love hotter shoes .Nice prize. Probably the most comfortable, but with style, shoes and boots I've ever owned, they even allowed me to wear heels (albeit small) for the first time in years! Would love new comfy boots ..and what better than Hotter for style and comfort . As proclaimed......I can walk 500 miles in HOTTER shoes ! Comfy shoes that stay comfy while you walk miles around the shops doing the Christmas shopping or just going for a walk. Oh , how I long for feet that don't ache! Ooh I just love Hotter shoes, they are so comfy and I have just bought my husband a pair and he loves them too now, so I'm hoping I'm lucky in this competition, fingers crossed. Another great prize, good luck everyone! What a fabulous prize. I love Hotter shoes as I have problems with my feet and their shoes are the most comfortable. However, being on a State Pension I cannot afford to buy them very often, so I have to wait until my shoes are completely worn through before thinking about buying more. I love shoes and can never have enough! The Hotter range looks wonderful. They say it's going to be a very cold winter indeed. I can imagine being snuggled up in 'Hotter' footwear when the cold weather arrives! Used to be a regular customer. I notice they have a wider range of styles and fittings ..so fingers crossed! To walk in comfort, oh yes please. Wasn't aware that Hotter did a men's range of shoes. What a fabulous prize - I would love to win. I have a pair of Hotter slippers and the shoes look so very comfortable. Have always wanted a pair of Hotter shoes, but a little out of my price range. I could not afford to purchase a pair now as on a Pension, but would love a soft comfortable pair of boots for the Winter. I had a pair of Hotter shoes a few years back and they were so comfortable. Sadly I can rarely afford a pair these days. Good luck to all who enter! Love Hotter shoes, would love to win the prize so I can try their boots too! I love Hotter shoes but can only buy them occasionally when the sales are on. They are so comfortable and last for years. 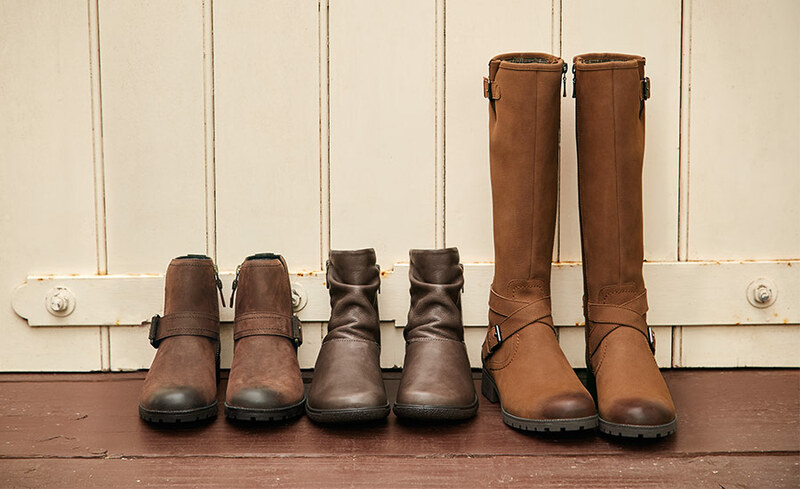 Lovely range of shoes and boots in store just now. Would love the opportunity to wear some of them. I really need some comfortable shoes for Winter, thank you. Love, love Hotter shoes. Would love to win! The comfiest shoes that I've ever bought! Have heard very good reports of Hotter footwear and am pleased to have the chance of trying them for myself. I've heard a lot about Hotter footwear but never worn them. If I am lucky, I may have an opportunity!! I would appreciate winning, and wearing, such comfortable, stylish shoes. What a super prize. At the age now to appreciate Hotter - if only I could afford them (or win them)! Lovely, just in time for Christmas Warm Feet!! I love Hotter shoes, they are great. Yes, please. Comfy, comfy shoes! Just perfect items for doing all the walking on the Trip of a life time we are going to win in December. Great looking shoes for a great one off occasion. Worn hotter shoe's and slippers for year's, some of the most comfortable shoes and slippers I have ever worn, and they last. I love the comfort of hotter shoes so to win would be a dream. Style and comfort. Oh bliss! I have several pairs of shoes and a pair of boots ... just love Hotter and can never have enough of them! Have wide feet and Hotter fits perfectly! Comfort is so important and there are no shoes more comfortable than Hotter shoes. Comfort and style, what more could you want? I love hotter shoes but have never got round to buying a pair of their boots ,so it would be great to own a pair . They look just amazing....bet they are comfortable. Loving the boots, just what's needed at this time of the year! Have had quite a lot of feet problems & am limited on what shoes I can wear and a friend told me that I needed some Hotter Shoes, so when I saw this competition I couldn't resist! But good luck to everyone who's entered! Would be lovely to win. Would be an absolute delight to win hotter boots/shoes. Always stylish and comfortable. Toes crossed for a win! Would love to add to my collection of Hotter footwear. fabulous styles but so comfortable as well, one can never have too many Hotter styles. Perfect gift to win at this time of the year, excellent warm and comfortable boots, to keep out the winter weather. Love to win this prize, they look so comfy! Boots would be nice and warm for winter. The most comfortable shoes I have ever had ! I could be a comfortable Silversurfers in a pair of these . Mmmmm, could do with some winter boots. My friend buys Hotter shoes. She says they're soooooooo comfortable. oh for a decent pair of shoes. My ideal prize that will last for a long time. nice looking shoes heres hoping!! My name is Shirley and I'm a shoeaholic! Such a lovely varied range of choice! Such comfortable shoes, never want to wear any other make. Really comfortable shoes, like walking on air! Amazing comfort plus style. Win win! Class, style and absolute comfort , what more could I ask for! Is anyone else having trouble entering the competition, I have tried 3 time so far, to no avail, I will go away and try again later, I would love some hotter shoes on my arthritic feet that fit properly. I love these shoes. ..
Hope I will be hot footing it to Hotter soon! Great shoes, however you should know that you will be bombarded with junk mail now and also phone calls. I find hotter shoes so comfortable plus they have some lovey styles to choose from. I'm new to Hotter - so starting to discover the various ranges - really do need foot comfort, but interested to know accessories also available! Love to win something ... please. These shoes are so very comfortable. It may seem they are expensive to buy, but in fact they wear for a very long time. Great - here's hoping! Badly need comfortable shoes after breaking my ankle. Great shoes, comfortable and stylish. Hotter really have a passion for shoes and my feet would be greatful for that! My "Hotter" shoes are the most comfortable pair I've ever worn - love them! Recently bought my first pair of Hotter shoes love them! Hotter shoes are great as I have Haley rigidus and have trouble with shoes in general! Great shoes, would love to own a few pairs! I love the new styles in Hotter shoes, it's good to be able to combine comfort and trendy together! Always comfortable like walking on air! And looking good too! You really just need two things in life, a good bed and a pair of shoes, because if you are not in the one, you are in the other. Love Hotter shoes, they last for ever. One of the only places to get comfy,quality shoes plus they have waterproof styles! Received their catalogue a few weeks ago and picked out a two lovely pairs which I would buy if I had some extra to spend, so everything crossed! Keeping my fingerscrossed. Love these shoes. They are so comfortable.